If you’re looking for work, a new house, things to do or local news in Falkirk then s1 has a website to help you find what you’re looking for. Although only the 20th most populous town in Scotland, Falkirk is the administrative centre of Falkirk Council and therefore an employment and entertainment hub for the whole area. Feeder towns to Falkirk include Grangemouth, Bo’ness, Denny, Larbert and Stenhousemuir. Like many towns that expanded during the 18th and 19th century, Falkirk exploited its location and natural resources to create companies and create employment. Being connected to both the Forth and Clyde Canal and the Union Canal, a lot of Scotland’s raw materials and finished goods were transported through the town. This also made the area practical for manufacturing businesses who needed easy transportation of their goods across Scotland. In recent times Falkirk has suffered from reduced industrial output but has instead moved into smaller, more niche engineering and IT services. For the period Oct 2011-Sep 2012, Falkirk boasted a 71.3% employment rate where the national average for Scotland was just 70.8% (Source: ONS annual population survey). 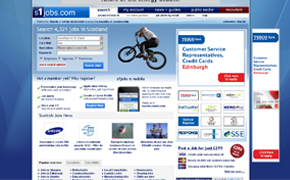 Currently there are over 60 jobs in Falkirk advertised on s1jobs.com. The contrast between the small wealthy areas in Falkirk and the worse off, outlying areas, means that averaging asking prices in Falkirk (£139,005) are the second lowest in Scotland behind North Lanarkshire (£126,560) (Source: s1homes Scottish House Price Report). Falkirk also has one of the biggest ‘reality gaps’ in the Scottish housing market with the average asking price of £130,053 and an average selling price of £121,292 for quarter four of 2012. To help boost the social housing stock in the Falkirk area, Falkirk Council has agreed in January 2013 to build 80 new homes at a cost of £8m. Half of these homes will be built on the site of the former St Mungo’s High School and the other half will be built outside the town in Maddiston. 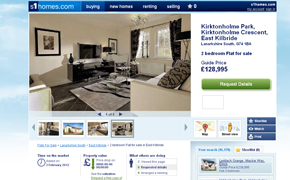 Currently on s1homes, there are over 600 houses for sale in Falkirk and over 250 flats for sale in Falkirk. There are currently over 90 flats to rent in Falkirk on s1rental. Falkirk is home to one of Scotland’s newest and largest tourist attractions, the Falkirk Wheel. Completed in 2002 to connect the Forth and Clyde Canal to the Union Canal, it replaced a series of 11 locks which had stopped being used 70 years earlier. The site of the wheel contains a visitor centre where you can learn more about the construction and go on a boat trip through the wheel. Callendar House/Park is also a big visitor attraction in the area with a popular museum and year round events. From 2000 – 2009 it played host to the Big in Falkirk festival. Falkirk has a lively music scene with lots of bars hosting live acts every weekend. The biggest gigs take place at Falkirk Stadium home to Falkirk Football Club. To see more of what Falkirk has to offer then check out s1play.com where you can find information on over 400 gigs, plays, exhibitions and other events across the area. Falkirk is connect to Edinburgh, in the south east, via the M9 motorway and Glasgow, in the south west, via the M80/M876. The M9/A9 then also connects Falkirk to Perth in the north. Retaining its position as a transport hub, Falkirk has two main train stations, Falkirk High and Falkirk Grahamston, which connect it to Glasgow, Edinbugh, Perth and a host of local stations. Although used more for pleasure rather than commuting, Falkirk is of course still connected to the Forth and Clyde Canal and the Union Canal. These connect Falkirk to both Glasgow and Edinburgh for those lucky enough to have access to a boat. The Falkirk Council area has a well regarded educational environment with 50 primary schools, nine secondary schools and three special needs schools. There are also two collages in the area; Falkirk College of Further and Higher Education and Forth Valley Collage.